Perfectly motionless, you wouldn't have even noticed the lizard lying on this rock except for the slow blink of its eyes and the occasional lazy flick of its tail. You stop in front of the rock, reaching inside your cloak, feeling for a few of the grapes you always have with you. Quickly finding the treats, you set them down beside the large lizard, waiting to see if the anaugi will take them. The anaugi regards the offerings thoughtfully, then flicks a long tongue out to taste one before deciding to eat them. Finished, it turns to regard you, cocking its head questioningly and all but demanding more grapes. You reach out and gently scratch its head, and the anaugi leans into the caress. You watch as the lizard slowly deepens to green, and under your hand its head becomes warm. With a final scratch, you finish your visit and step back onto the path. Behind you, a small, harmless shrub is disintegrated as the anaugi shows you its opinion on the lack of grapes. Anaugi are beautiful creatures, known for their indestructible scales that change colors. Although usually warm tones, anaugi slowly turn brilliant greens or blues when calling on their powers. They are strong in fire magic, and often pair with magi who are powerful in the same art. 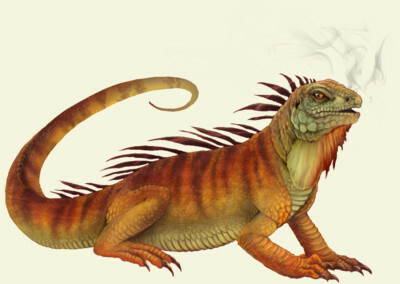 Magi specialized in fire are known to have short tempers, and these lizards share that characteristic. They are proud creatures, easily slighted and aloof towards anyone except their magi, whom they are exceptionally loyal to. They surrender their dignity when it comes to human companions, and can usually be enticed into a lap with fruit. Anaugi enjoy exotic fruits, especially from their home, Raza, but they eat mostly leaves. As with most adults, they forage for their own food and can often be seen slowly wrecking someone's hard work in the castle gardens.